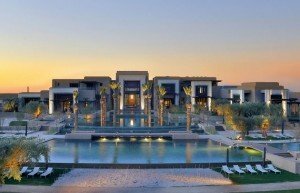 An exclusive and mind-blowing incentive experience in Marrakech & Agafay desert. Let the ochre city and its secrets give colour and shape to your vision. Meet & Greet at airport. Welcome dinner to your hotel. 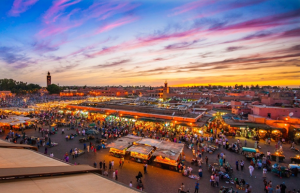 Your first Marrakech experience will be gastronomic. The talented chef will surprise your taste buds and you will end your night in a delightful and cosy animation. After your breakfast, let’s walk through medieval dimension in old Medina (16th century Ben Youssef theological school, 12th Almoravid Dynasty Dome), taste local bread or visit public steam bath. We are then taking you to the historical caravanserai called Fondouk (once used as hotels for the caravan traders) where ancestral skills and art crafts are still perpetuated by artisans. Have lunch in the Medina. Dinner in trendy and chic restaurant “Bo & Zin” or similar and end the evening with a party in one of the clubs in the city. Today we drive you to the steep alpine peaks of the Atlas Mountains after your Berber breakfast. The isolated region still maintains a unique character, language, architecture. 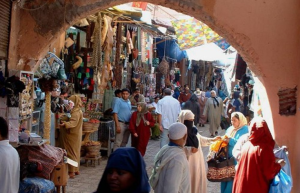 Meet locals at the Berber village, have a drink; then lunch and relax at Kasbah Toubkal. 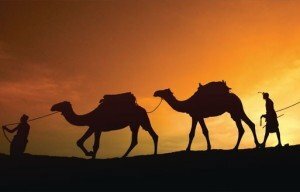 Drive to Agafay rocky desert from where you will ride your camel to your camp. Tea at sunset plus traditional style dinner under tents with local entertainment. 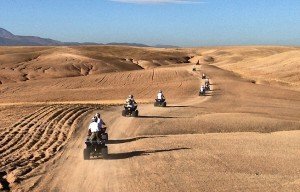 Right in the heart of the Agafay desert in the High Atlas Mountains you will be offered another delightful experience, a quad tour. It’s your last day; we first make sure you won’t leave without your ochre inspiration before taking you to the airport for your return flight. Including accommodation on BB basis , meals without drinks, Tour– Excursion & Transportation.